Five Irish DIY lovers share their easiest projects. WITH THOUSANDS OF Instagram interiors accounts at your fingertips, there’s absolutely no shortage of inspiration, especially in an Irish context. What can be difficult however is trying to recreate that style in your own home without a huge price tag. That is, unless you’re willing to Do It Yourself. For those who are willing to put in a few hours at the weekend, you can create completely unique, inexpensive and often, sentimental pieces for your home. And you can get easily get your hands on everything you need at local DIY stores like B&Q. If like many of us, your current balance wouldn’t stretch to an original artwork, there are many affordable options. Sean McCarthy of interiors blog DIYnewb.ie uses free stock image sites like Unsplash.com. Darren Heaney of Old Victorian New prints his own phone-captured images of buildings and landscapes. I love to spray paint plain black or white frames in really colourful colours to house my favourite prints or pictures. 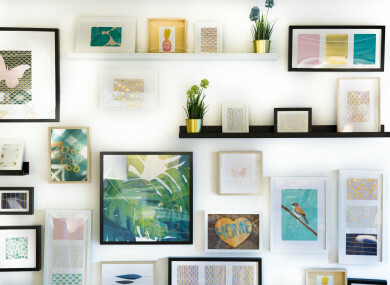 It’s great to use lots of different colours to create a really colourful gallery wall. With some wood cut to the same width as your bed, you can create an impactful bespoke headboard surprisingly easily. Fix it to the wall when it’s complete. Choose a wood stain or leave it ‘natural’ for a more industrial look. An easy way to add a new burst of colour is to reupholster a headboard with a few metres of new fabric and a staple gun. You can make it look completely different for less than €20. I upcycled a plain white kid’s table recently by painting the top of it with pink chalkboard paint (it doesn’t have to be black). My girls have great fun drawing on it and it’s really easy to clean. A chalkboard calendar on our kitchen wall would be perfect for our changing schedule and keeping track of activities. If you add a layer of metal paint underneath, you can also hang notes on it using magnets. All leftover floorboards need is a sand and a wax. I bought wall brackets from a local DIY store and used them as open shelving in my utility room. Inexpensive, simple to do and really useful. Take a set of cube shelving like you might get in B&Q, turn it on its side and fit a cushioned seat on top. You can fit all the shoes and bags in it and the kids have somewhere to sit. In a bedroom, fill the shelving part with books so kids can sit on top and read. I’m a huge fan of contact paper. It’s something people tend to think of for covering textbooks but it can be used around your home. I just covered the kitchen counters in faux marble to update our apartment. You can also use it on dining room tables, coffee tables, shelves and containers to give them a luxurious look for a fraction of the price that real marble would potentially cost. A fresh coat of paint makes a big difference. Fresh towels, some shelving and a new blind can give a whole new look. If your budget is very limited, changing taps and adding mirrors is the way to go. Do these sound like features that would look great in your home? B&Q have everything you could possibly need to upgrade your home with easy DIY projects. They even have loads of handy how-tos to get you there. Have a look at what they currently have in stock, find your nearest store or book a design appointment. Email “8 home DIY projects you definitely don’t need to hire a professional for”. Feedback on “8 home DIY projects you definitely don’t need to hire a professional for”.